I was lucky enough to get to go to Marche once again this week with a friend of mine. Marche is one of my favorite Nashville restaurants and I am showing them off so that they might be one of your favorites too! It happened to be their 6th birthday when we were there too so Happy Birthday Marche! Stick around! They have a simplistic menu that changes on the 1st of every month. I anticipate seeing what they will come up with each time. Nothing is overdone but everything is big on taste. 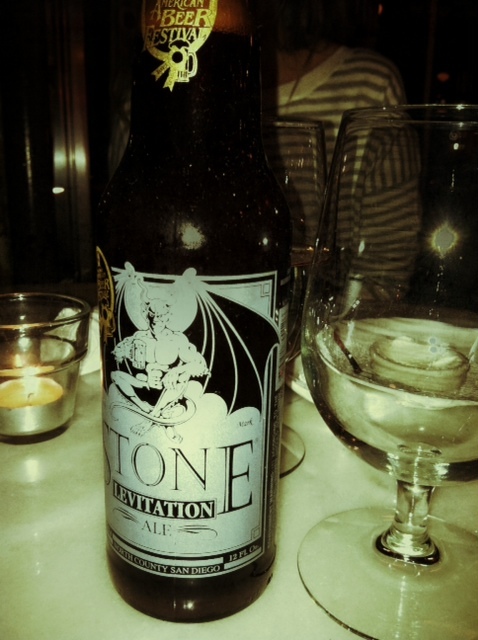 I started out with a beer I have never tried from Stone, it was called Levitation and it was delicious! It was a really hoppy amber ale (I am no beer expert mind you) and it was perfect for a fall dinner. 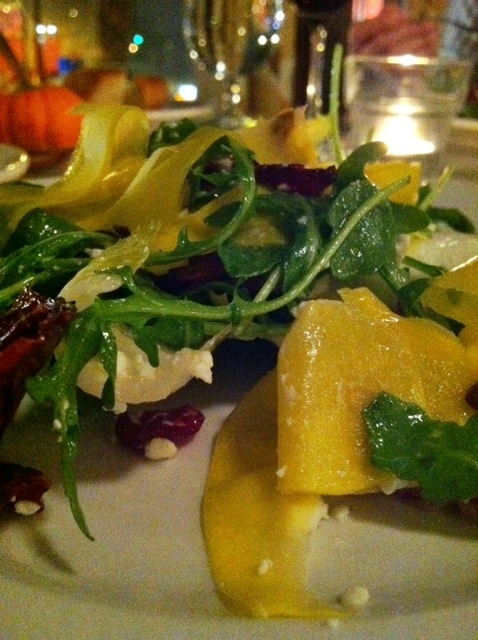 Next up was a Shaved Squash Salad with pumpkin seeds, goat cheese and cranberries. It was straight forward and light. 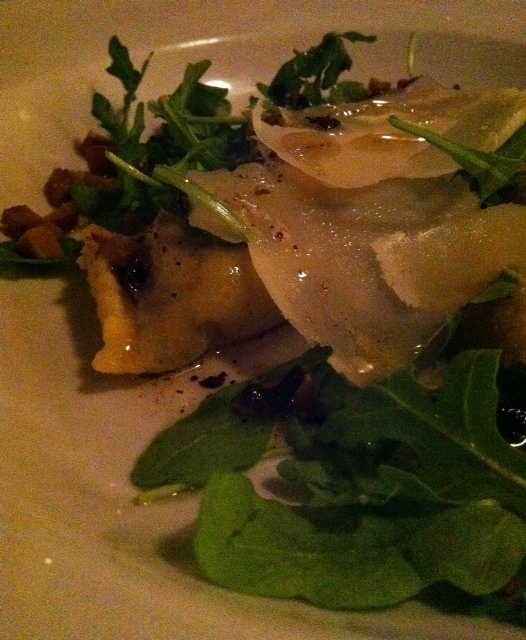 The Mushroom Agnolotti (stuffed pasta) with marscapone cheese and sage butter was really rich and the pasta was perfectly pillowy (is that a word?). 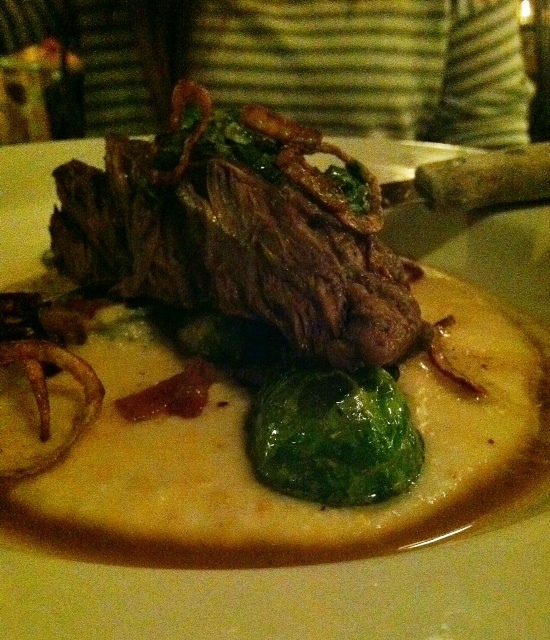 The star of the meal though was the Red Wine Braised Short Rib. It was served with polenta, Brussels sprouts and fried shallots. It was full of flavor and really to die for. I may have to have it again before the month is up. If you get a chance to try Marche during the month of November I would highly recommend their current menu but I am sure whatever they bring in for December and 2013 will be equally delicious! If I were rating this meal on a scale of say 1-10 apples 🙂 I would give this meal an 8. Thanks Marche!